Takuwan, also spelled takuan, is a Japanese pickle made from daikon, the long white radish frequently used in Japanese cuisine. 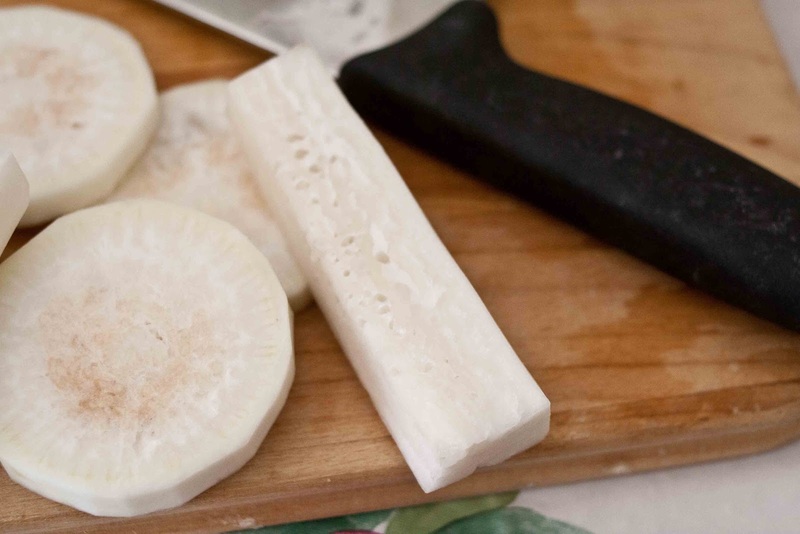 I remember eating takuwan my grandmother made when I was little, she cut the daikon in small spears and didn't use much food coloring--hers was light yellow in color. 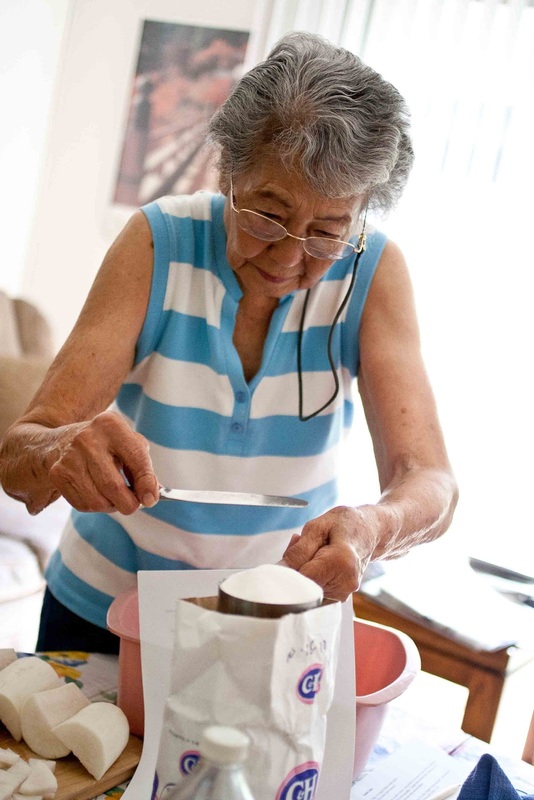 Recently I was invited to make it with our friend Robert's mother, Masako Miyake, who's famous for making tasty takuwan. Robert's been sharing her takuwan with us for years, so I was happy to go to her house and help her make some for her church bazaar. Robert is featured on our Sesame Balls post, after the cooking instructions. Mrs. Miyake's takuwan is the yellow one, and mine is the white one in the background. My husband prefers it without the food coloring and I'm happy to oblige. 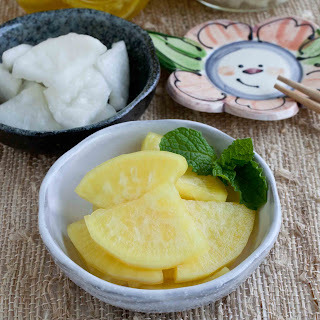 Making the takuwan yellow comes from the artisan method or old fashioned method of making takuwan in Japan, this longer method can be seen on Takuan/Japanese Pickled Daikon: Basic Recipe by the Shizuoka Gourmet. 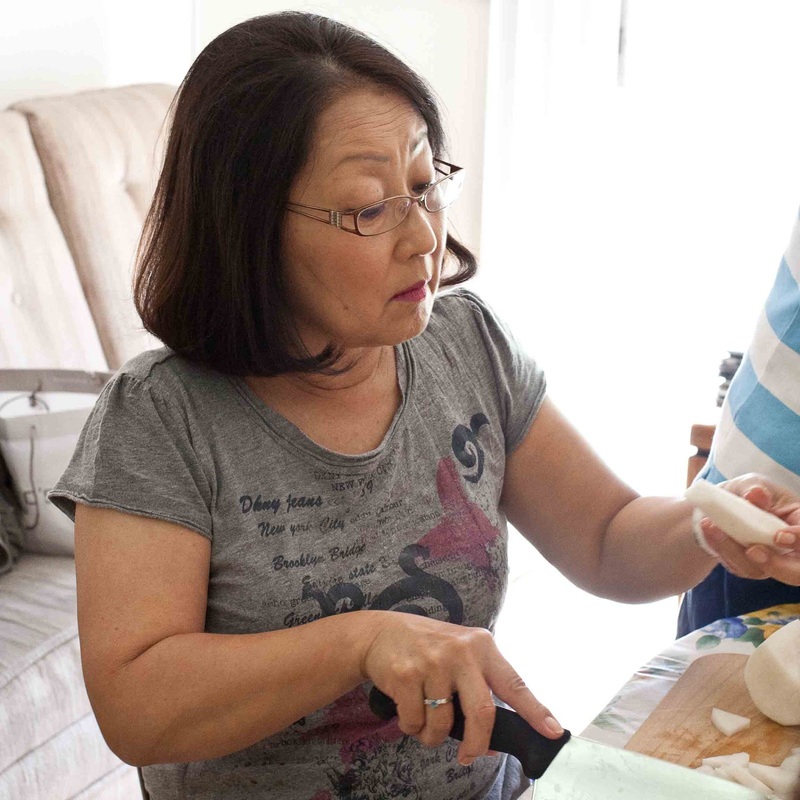 Mrs. Miyake's recipe is sweet and takes a lot less time. This is a Japanese-style peeler. 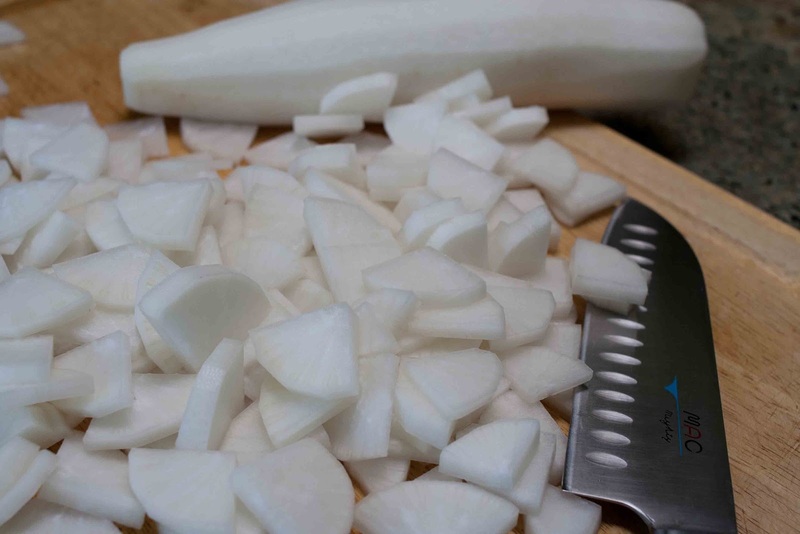 I like this type best for peeling daikon. This is Judy, Mrs. Miyake's daughter, peeling daikon. 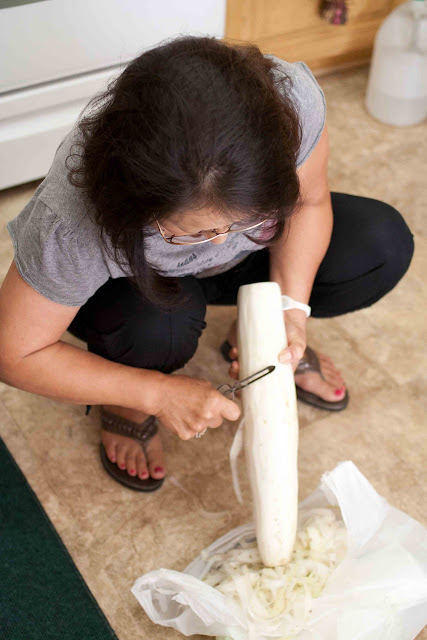 She finds it more comfortable to peel the daikon in this position. 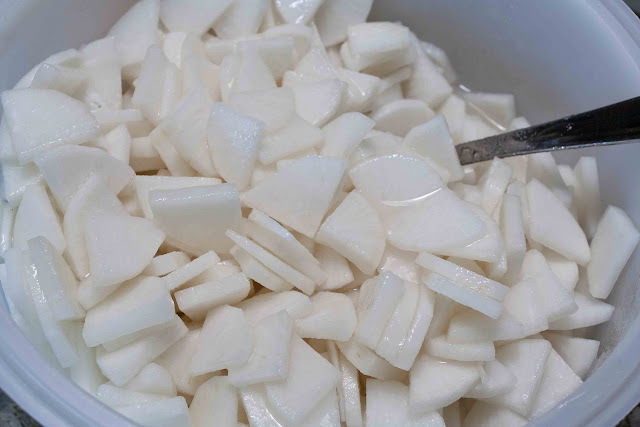 Then cut the daikon into pieces, whichever shape you prefer. 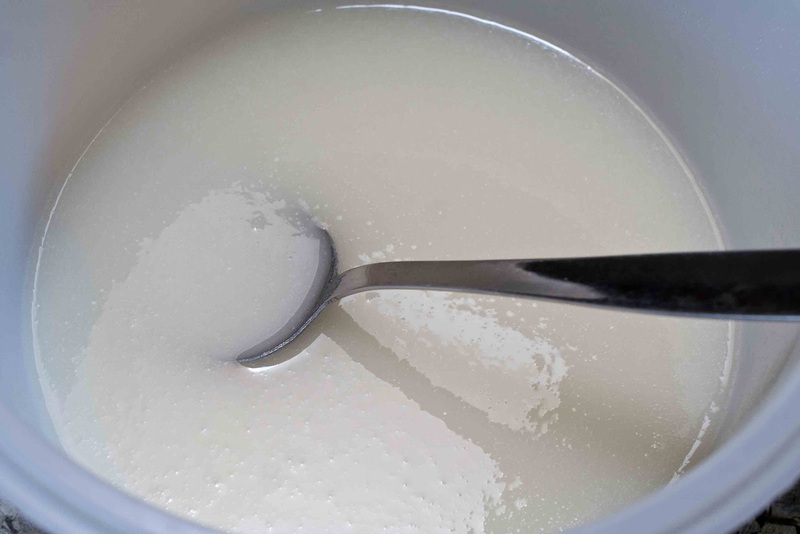 Mix 3 tablespoons salt, 3-3/4 cups sugar and 1 cup vinegar into a bowl. Add the sliced daikon and mix thoroughly. Let the daikon mixture soak on the counter overnight, stirring occasionally. 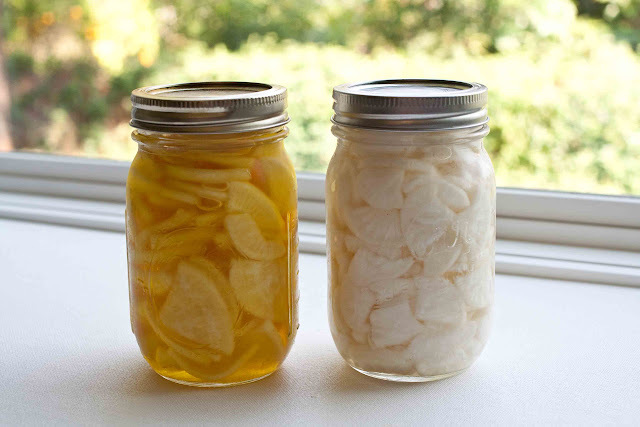 In the morning, squeeze the daikon and pack it into jars. Then boil the juice and add a few drops of yellow food coloring. While boiling, remove any scum that may appear and boil until the juice is clear. 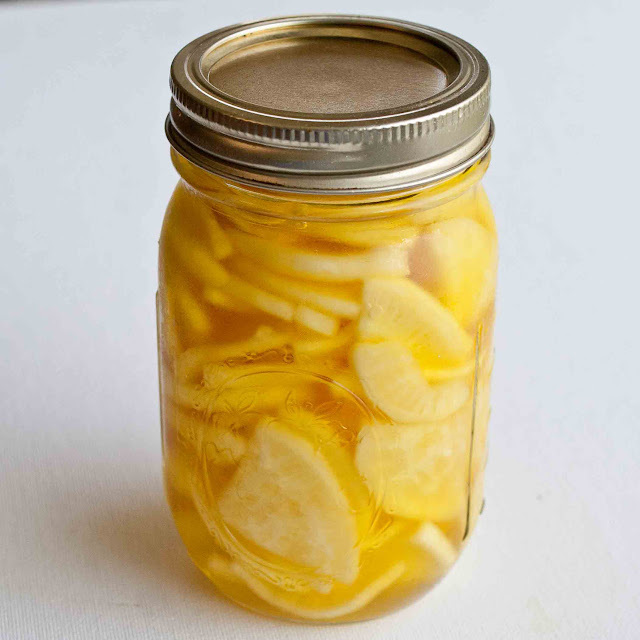 Pour the juice into the jars over the daikon. The takuwan will be ready to eat in two weeks. I'm always so happy to receive a jar of Mrs. Miyake's takuwan. Her favorite jars to use are the ones that come from Knott's Berry Farm jam. I'll have to save them for her whenever I get them. She likes the shape and the amount of tsukemono it holds. I'm excited to taste mine in two weeks! Put a few slices of takuwan into a bowl of ochazuke (rice with tea). She was down to the business of making takuwan. Judy's friend Jean was there to help too. 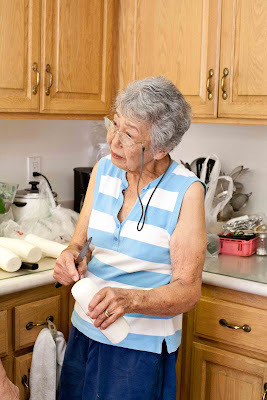 We first peeled the daikon--which wasn't optimal--and Mrs. Miyake had to inspect each piece and cut away the bad parts. I think Judy shows a strong family resemblance to her dad, Shump. I've seen Mr. Miyake have this same expression many times. Seeing Judy make this expression makes me smile--I like seeing him live on through his family members. Mrs. Miyake is measuring the sugar for the marinade solution. Choose daikon that is heavy for it's size--then there's less chance that the middle will be pithy as shown in the picture above. Those are the pieces we didn't use. 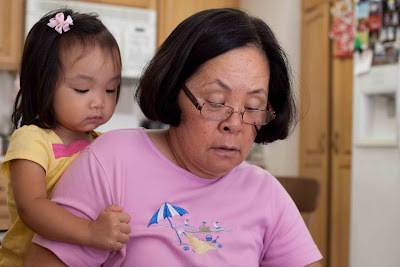 This is Jean and her granddaughter. Jean's granddaughter was so cute. 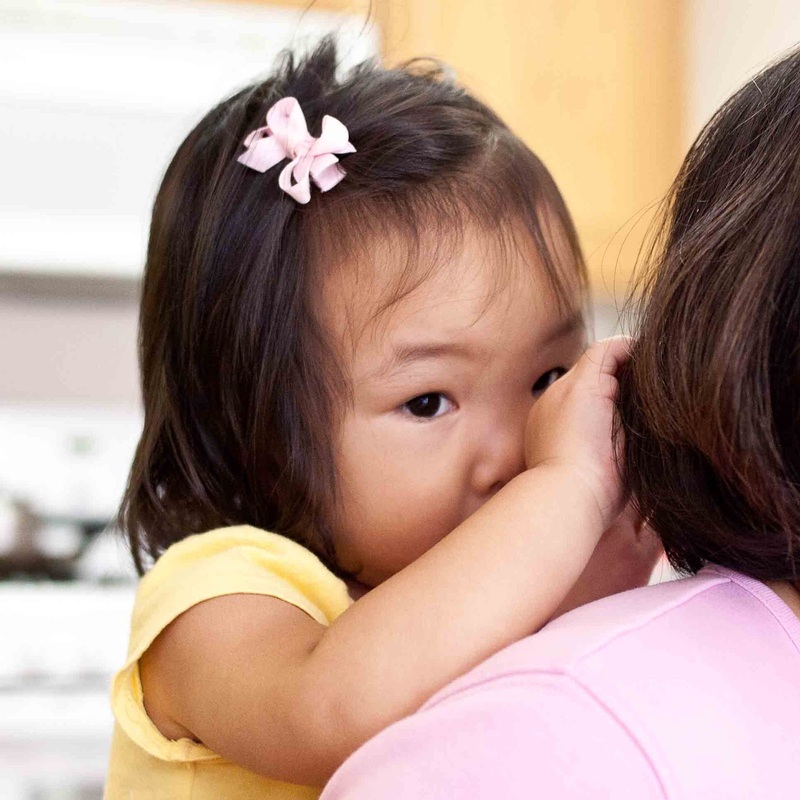 She'd cuddle up behind her grandma, grab a strand of her hair and that would comfort her. All in the midst of making Mrs. Miyake's Sweet Takuwan. 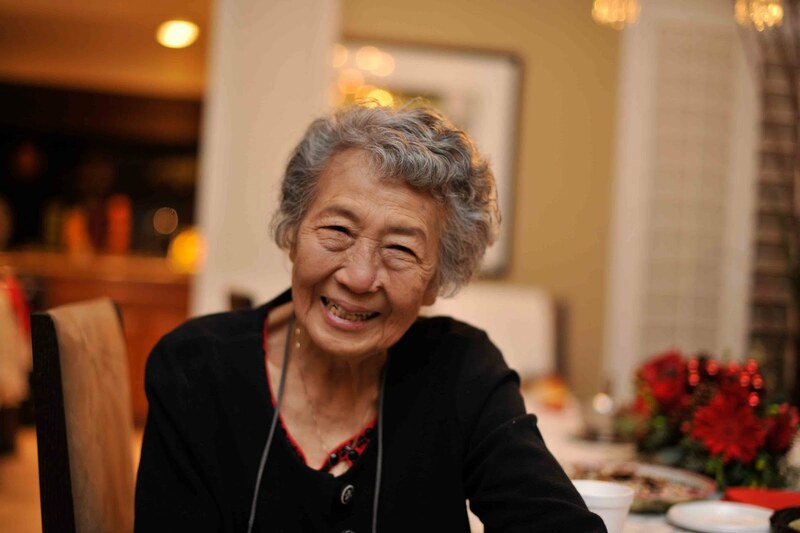 Here are some photos of Mrs. Miyake courtesy of her granddaughter Lauren. 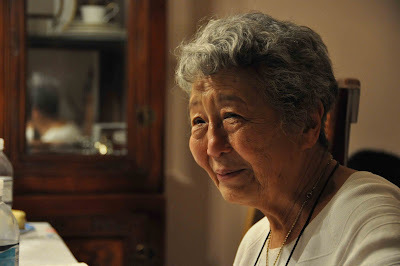 Mrs. Miyake has such a nice smile. If I ever get to be 93 years old, I'm going to wear it like a badge. She's adventurous and likes to travel. Robert sent me a photo of his mom sitting on a motorcycle--I wish I could find that one--it was the perfect example of how adventurous she is! I think I remember seeing one of her sitting in a helicopter, too. Here's Mrs. Miyake with her great-grandson. 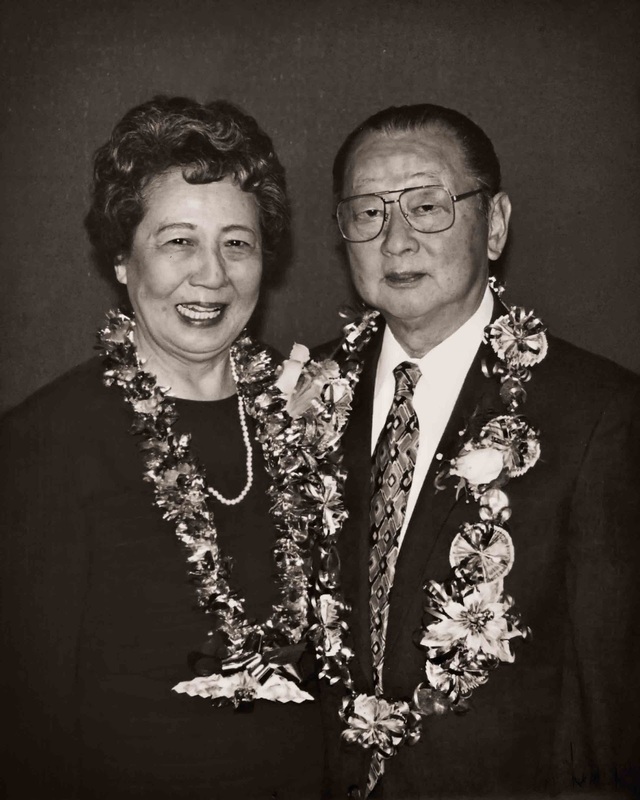 Mr. & Mrs. Miyake used to pop over to my house occasionally for a visit--on their way to their son's home. On those visits, I remember Mr. Miyake was pretty quiet and Mrs. Miyake was chatty. I really like that about her--I love chatty. Here she is with her grandkids. 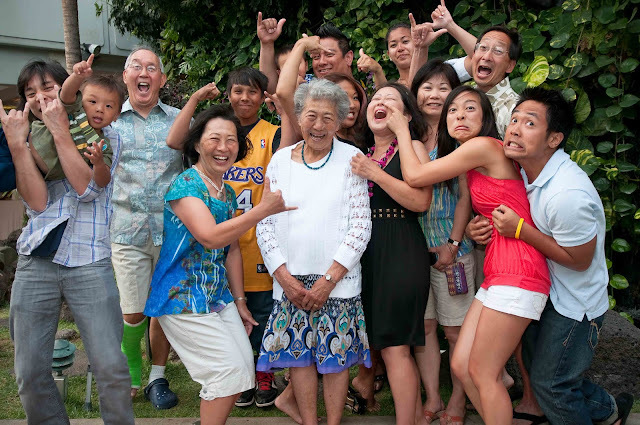 This is Mrs. Miyake's whole family on a trip they all took to Hawaii. They look like a really fun group, don't they! Thank you, Robert and Mrs. Miyake for thinking of me and inviting me to come make your delicious takuwan. 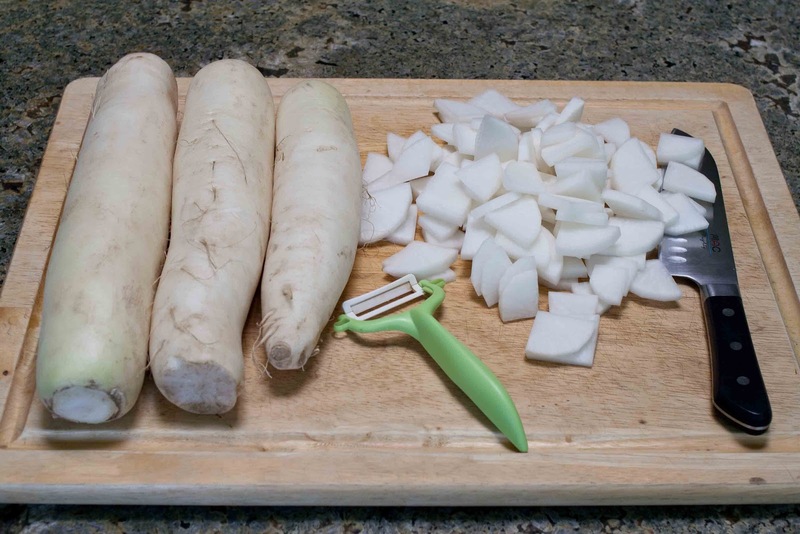 Wash and peel daikon. Slice into thin pieces. Mix salt, sugar and vinegar. Then add daikon to this mixture. Soak over night, stirring occasionally. Squeeze daikon and pack into jars. Boil juice and add a few drops of yellow food coloring. While boiling, remove scum and boil until it is clear. Cool. Pour juice into jars. Refrigerate. Takuwan should be ready to eat in two weeks. I am going to make this - I love crunchy, pickled diakons. My dad used to treasure her tsukemono! Thanks for the reminders. I love it. Thank you for documenting such a special part of our family's tradition!!! Now I just need to go out and make some of grandma's takuwan myself! I love this! Auntie Mas is my mother's oldest sister and we all adore and love her! She is such an inspiration to us. I love this too! 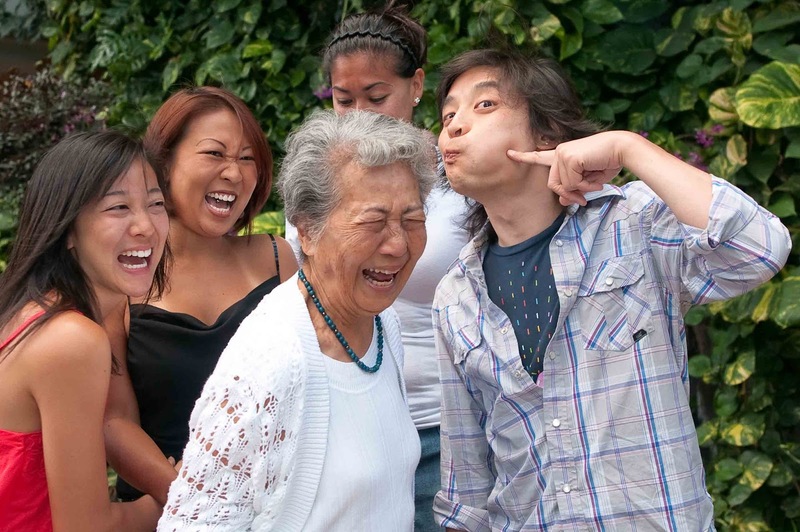 I love Auntie Mas (my dad's sister) and her wonderful talents and ever-present smile (my son remembers her as the smiley one). The family looks great. I checked out Keith's pictures on the sesame balls post too - a friend just gave me one last night and I am wanting more. Thank you for posting these wonderful memories of such happy times and good food. 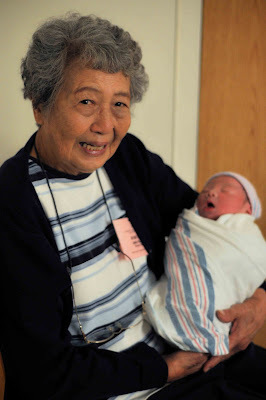 Cool blog on Auntie Mas! I agree with the others, her takuwan is the best!!!! Carol has the negatives of the motorcyle and helicopter pictures. . . I started making this today, very excited as i live in Yellowknife which is in canadas arctic. When i lived in new jersey i could get takuan from mitsua, but its no avalible here and is my fav. One question! My takuan has been sitting for about 6 hours and i followed the recipe to the letter, however my takuan sliced and quite shriveled. Im wondering if i sliced it too thin? 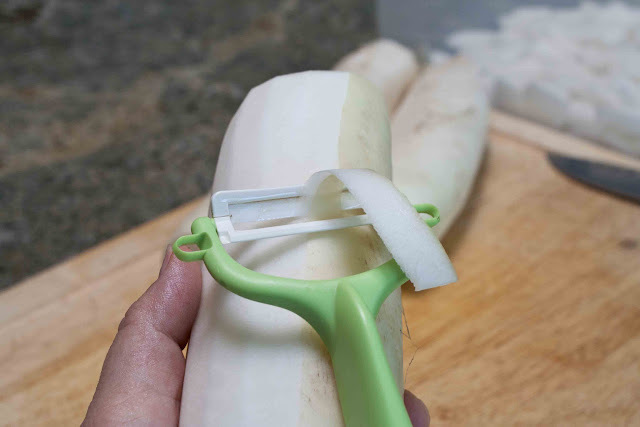 My husband recalls that the daikon was quite soft and bendy when he purchased it. Other daikon takuan recipes call for the radish to be soft and bendy ( some say leave out to dry for a week!) 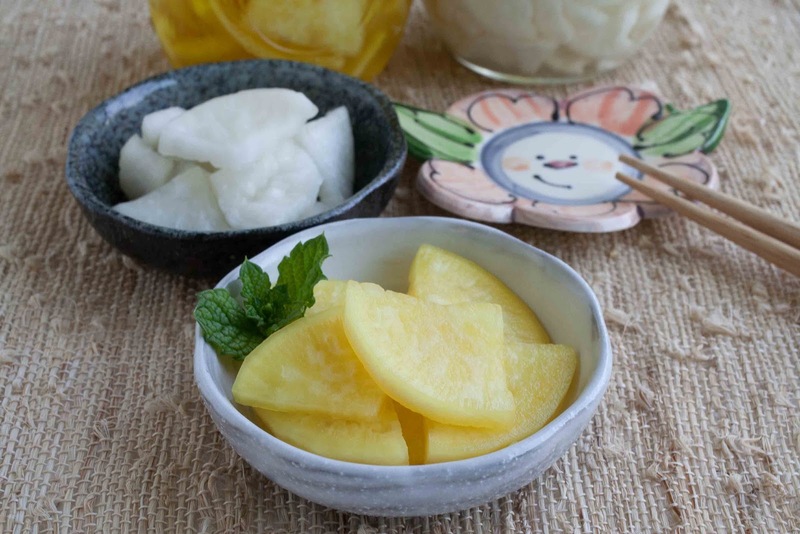 For this recipe should the daikon be freshly crisp? It smells and tastes perfect so far, if not better than store bought. So, any idea why mines so shriveled? Thank you for sharinv this recipe. Its so nice. And my new fav. @honkeytonkwoman--Thank you for your comment! Don't worry, your takuwan is okay, mine was a little shriveled too. You can see it a little in the first photo. Be sure you boil the juice before you pour it into the packed jars. I'm not exactly sure why the daikon gets shriveled like that, but I do know that the salt draws out the water in the daikon, it wilts, but gets crispy again. I was looking for a tried and true Japanese takuan recipe. Thanks for to you and Mrs. Miyake for sharing this recipe!!! I have been looking this recipe.A friend of mine had gave me some as a gift.Since then I totally hooked.Can't wait to try the recipe. So happy to find your blog today I want to make pickled diakon and cut into strips for sushi. Your instructions are so much appreciated. I have a question after they go into the refrigerator last step how long will they keep? Thanks so much for your help. 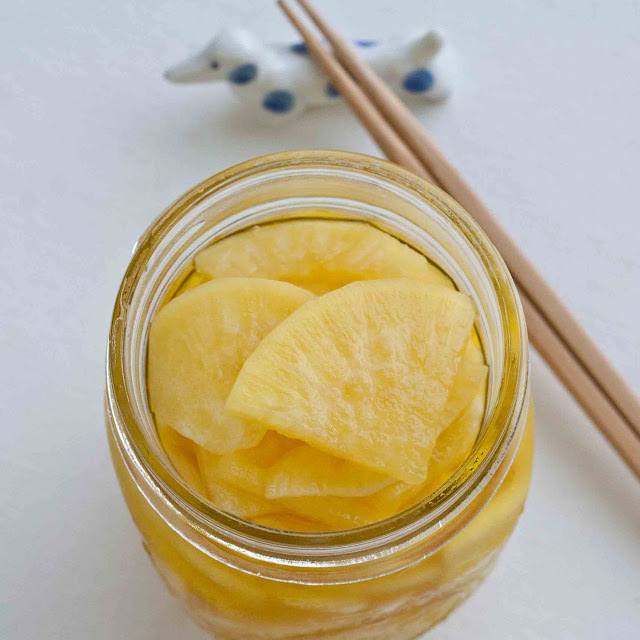 Lovely pictures and the most amazing japanese pickles recipe which i will surely try. Thank you so much! I'm headed to the store to buy ingredients right now. I have a question: when I went to boil the liquid it never really turned clear. Is this OK? How long does it normally take to boil clear? Thank you. Awesome! Thank you, I have been looking for an easy Takuan recipe for ages, found too many sokusekizuke recipes that only last a day! I made a small test batch of this recipe a couple weeks ago and it was ready this past Friday. I opened the jar and they smelled really awful and I was just wondering if that's normal or if I did something wrong to make them go off. Thanks in advance. Konnichiwa! 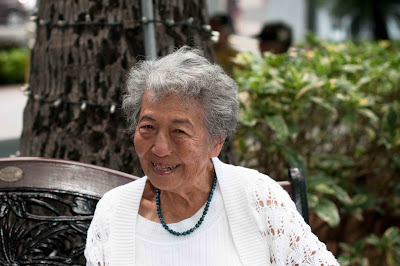 Domo arigato gozaimatsu for the post and lovely photos! They make me miss my Obasan very much. 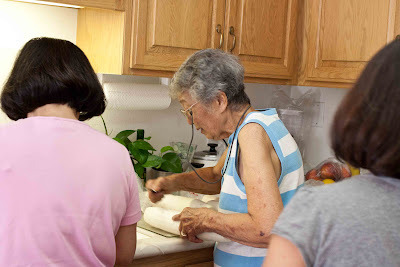 When she was alive, she was so intent on learning how to be American, that we don't know much of the Japanese cooking that we love. I did spend most of my time in the kitchen with her, making every meal, so I know how to make the few dishes that she taught me. I am learning how to do a few new things by myself, and Takuan is one that I have only had from the store bought packages. I know homemade is always better, but does this recipe have a flavor like the store bought, or is it completely different flavor? I am not fond of the store bought, I can only eat a little at a time before it is just too much. Thank you for your posts and blogs.... I am looking forward to learning more dishes to serve my family! Do you have (or can you write) a sukiyaki recipe? What goes in it, and how to properly cook and serve the items? A lil turmeric is what I use, its great for you, is used in traditional pickle making and adds natural yellow color, plus a great bitterness to compliment the sweetness. How much turmeric do you use? Not being much of a cook, I purchased a jar of takuan, akiyama brand. When I opened the jar fizzy bubble started to come to the top and continued for a long time. Is this normal? Or should I throw it out? Great and simple recipe. I'm an expat living in Japan and wanted to do something with all the daikon someone gave me. The Japanese recipes looked complicated with lots of drying and fermenting so I searched for "takuan" in English and tried this. Japanese hubby was doubtful when he heard what I was doing but after tasting them he's hooked. They certainly taste like what we buy over here. Thanks for the recipe (and "arigatou gozaimasu" to Miyake-san too). I used turmeric for the coloring as many had suggested. I'm guessing it would have a small affect on the flavour too? Hello. Should i dry the radish before? How much grams are 1 daikon? 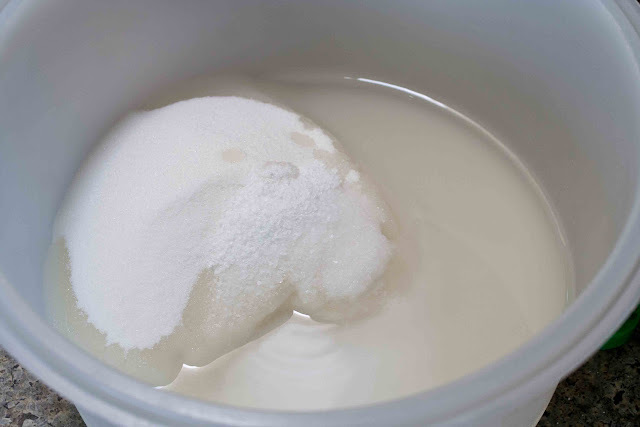 How much grams are 1 cup sugar? I have a question about boiling time, which wasn't answered when another reader asked: how long to boil? Of course I understand a simple instruction such as "until it's clear", but are we talking 10 minutes or 2 hours here? Some rough indication would be helpful.